When your small business grows, you need tools that will scale up with it. Teamup has the features you need for a growing business, with affordable pricing. Managing a small business can take a lot of time, especially when that business is growing rapidly. Basic systems that worked at one level may not work as customers and jobs multiply. Some enterprise solutions, however, are too expensive and complex for small business operations. 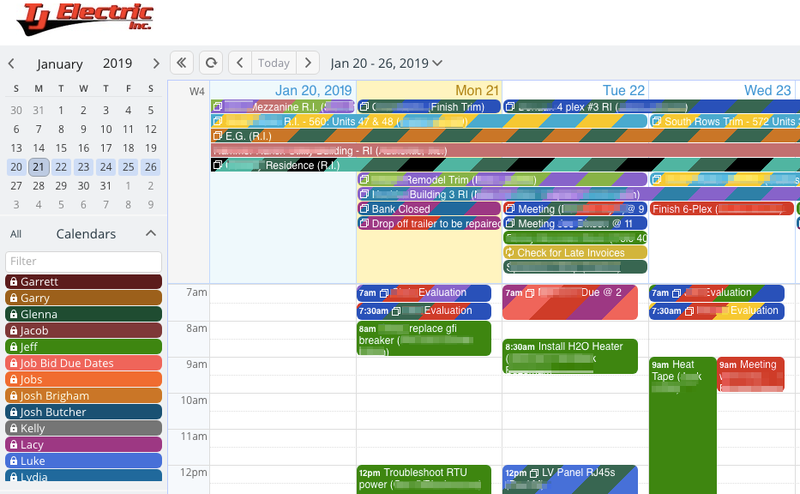 Teamup Calendar can be customized to have the right number of sub-calendars for a small, mid-size, or large business; it’s affordable (see pricing options here) and can easily scale as a business grows. Office manager Lydia Edgar shared how TJ Electric uses a Teamup Calendar to stay organized as their business grows. We are a small electrical contractor, located in Belgrade, Montana. We provide service for residential, commercial, and new construction. As strong advocates of the community, we strive to accommodate the unique requests of every individual customer. We take great pride in our work and clients, and our business has more than doubled in the last 3 years. Because our business has grown so much, our normal method of scheduling–a large, paper, wall-hanging calendar–was not working. Our service calls also increased exponentially, requiring a better way to communicate jobs with our technicians. Teamup allows us to schedule jobs when our contractors need them to start. We can assign as many people to a job as we need. Our technicians can follow the small jobs on their phones, and know which job they need to go to. 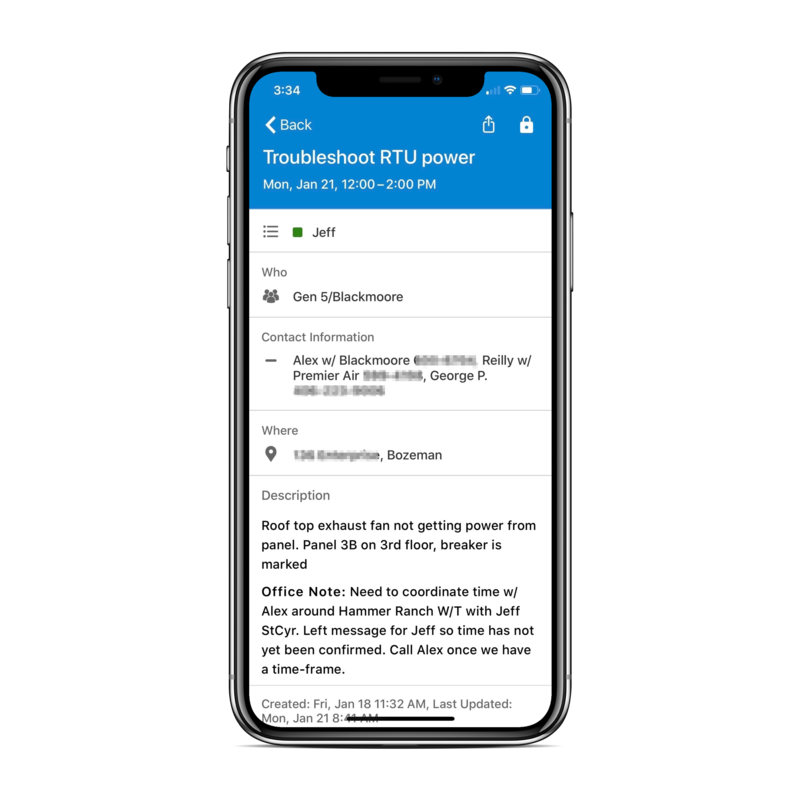 Having the contact phone numbers, Google maps connected to the locations, and notes for special requirements has been instrumental in keeping us on track. Techs can see job details on the Teamup mobile app. No longer are jobs slipping through the cracks, and we are able to get things scheduled right away for our technicians. Our electricians can keep track of their tasks and duties, and are more efficient thanks to Teamup! Assign an event to multiple sub-calendars: Any event can be assigned to multiple sub-calendars. If a job needs multiple technicians, there’s no need to create duplicate events for each technician’s sub-calendar. Instead, Lydia can simply assign a job to multiple techs, and it will show up on all of their sub-calendars. No duplication needed. Teamup mobile apps: Techs working on-the-go need to be able to check job details, location, and scheduling information quickly and easily. 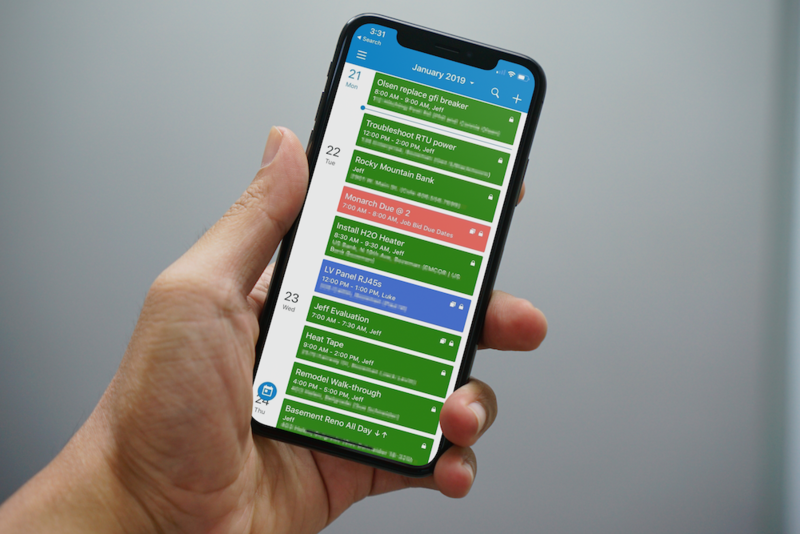 Teamup’s mobile apps for Android and iOS make it easy for them to stay updated on job information as they work. Map-connected Where field: An address input into the Where field links automatically to Google Maps. It’s safer and easier for techs to locate the next job. On their mobile devices, they can open the job event, tap the address, and it will open in Google Maps for easy navigation to the job site. Many thanks to Lydia Edgar for sharing this story!